light wear to tips and corners, previous owner's inscription to first blank page. An important collection of historical church documents and records of genealogical interest. Contains Churchwarden's Accounts; Deeds and Associated Documents; Miscellaneous Records. An appendix lists Abbots from 1032, Vicars from 1309, Members of Parliament from 1295, as well as the plate, registers and parish books held by the church over the years. First examined in 1827 and partially described in the Gentlemen's Magazine for 1830 they were then forgotten for half a century. 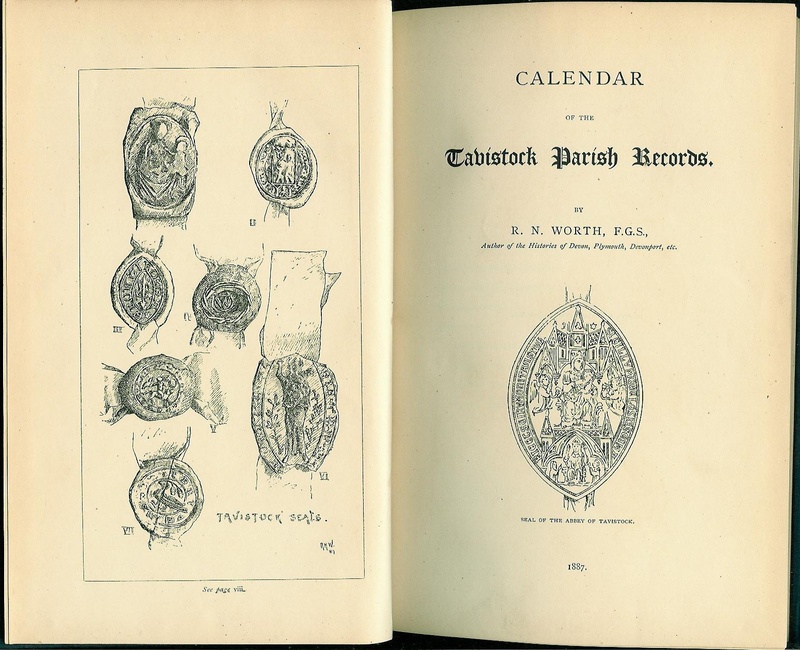 The records supply important genealogical material for more than three centuries before the Tavistock Church Registers begin in 1614. "Many points touching the social life of a provincial center in the Middle Ages are incidentally elucidated." The earliest of the records, a deed of 1287, date back 600 years from the time of publication The fragmentary Churchwardens' Accounts begin with a roll of 1385, significantly earlier than any records published before this book. In addition to records of the building and maintenence of church property, they include burial records for each year. The Abbey St. Mary and St. Rumon of Tavistock was founded about 961. It was the richest Abbey in Devon at the Norman Conquest and remained in existence until the dissolution. The parish church of St. Eustachius was dedicated in 1318. 8vo - over 7¾" - 9¾". Hard Cover.